Ingredients: Water sufficient for processing, mackerel, tuna, tapioca, canola oil, tricalcium phosphate, xanthan gum, taurine, choline chloride, vitamin E supplement, zinc oxide, thiamine mononitrate, manganese sulfate, vitamin A supplement, menadione sodium bisulfate complex, riboflavin supplement, pyridoxine hydrochloride, folic acid, vitamin D3 supplement. 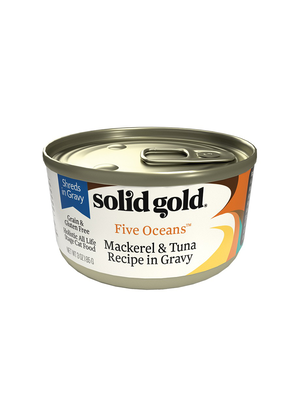 Solid Gold Five Oceans Mackerel & Tuna Recipe in Gravy is formulated to meet the nutritional levels established by the AAFCO Cat Food Nutrient Profiles for all life stages. We'll begin this review of Solid Gold Five Oceans Mackerel & Tuna Recipe in Gravy with a detailed discussion of the ingredients. The second ingredient is mackerel. Although mackerel is an excellent protein and omega-3 fatty acid source, raw mackerel contains more than 60% moisture. After cooking, the relative meat contribution of mackerel is dramatically reduced. Therefore, it's important to ensure that other meat sources are included within the first few ingredients to ensure the product derives most of its protein from meat. The fifth ingredient is canola oil. Because canola oil is actually an improved rapeseed oil, many people are wary of its nutritional impacts. Because ingredients are listed in order of pre-cooked weight, the remaining ingredients in Solid Gold Five Oceans Mackerel & Tuna Recipe in Gravy are not as important as the first five ingredients. Next we have tricalcium phosphate. Tricalcium phosphate is typically used for its mineral contents. 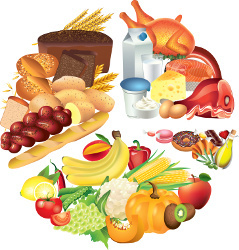 However, it can also be used to evenly disperse fat in wet food products. The next ingredient is xanthan gum, which is used as a thickening and suspending agent. It's usually produced by bacterial fermentation and does not provide any nutritional value. Moving on, we have choline chloride. Choline chloride is member of the B-vitamin complex (vitamin B4). Moving on with this review, we have vitamin E supplement. Vitamin E is an essential vitamin required by cats. The official PawDiet rating for Solid Gold Five Oceans Mackerel & Tuna Recipe in Gravy is 2.5 out of 5.